Magnacom’s comprehensive event production services cover everything from live sound and lighting to our specialized Infocaster software. With experienced, expert operators, Magnacom helps ensure your events are fully supported for success. See below for our detailed list of offerings. Just click the title for additional details. Also see our list of Convey Services and Success Stories. Electrify with an event onboard and be sure all your gear hits the high seas. From customs to handling protocol, our experienced strategic and logistics teams ensure everyone and everything sets sail for a successful event. 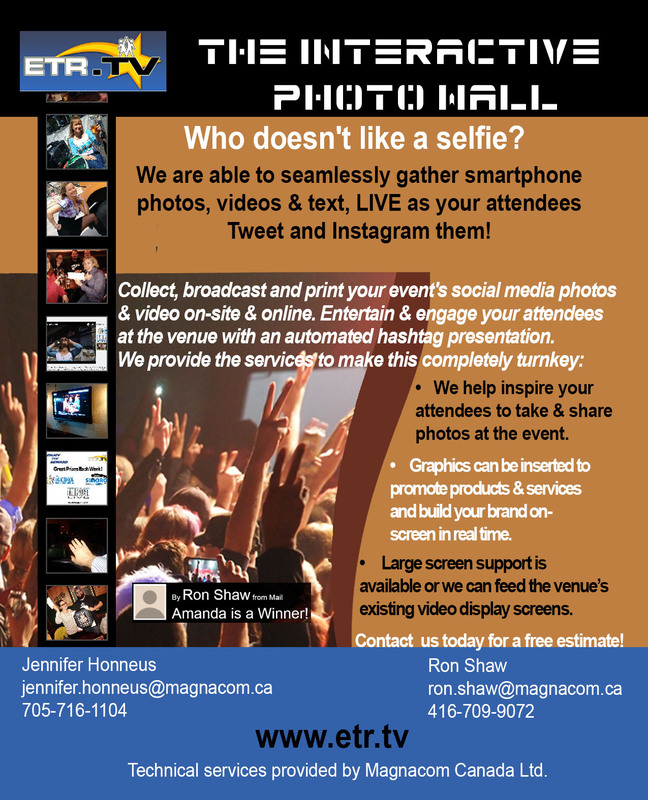 New and now available for meeting bookings, the MAGNACOM mStudio is a low-cost solution for your meeting needs in Toronto’s financial district. Coming Soon: The mStudio will be available for LIVE broadcast television interviews to any network worldwide. Amplify your event with sound for any audience. Supporting everything from plenary sessions with 1,000 people to breakout sessions with 30-40, our crisp, clear and expertly operated sound systems use all the latest technology. Display every detail with high-definition, large screen projectors. Yielding a picture as sharp as a high quality HDTV, our screens come in multiple sizes to suit your needs. Enhance your event and amp up your ambiance. Wow your audience with Magnacom's latest generation lighting. With multiple trade show booths and a creative team to design displays, we help increase your booth’s traffic and capture attention with innovative print and/or digital displays. Booths are available individually or for an entire show. Instantly communicate news updates and schedule changes to conference attendee hotel rooms, cruise ship staterooms or strategically placed on-site screens. Our real-time television channels keep everyone in the know. Use strategic digital signage or broadcast corporate video in HD. With our high-definition, weather-resistant, daylight viewable displays, you can convey inside or out. Engage your audience and add pop to a presentation. Use Magnacom-licensed innovative software to poll an audience and gain a live response, displayed graphically or numerically-- a fun, creative twist on typical Q & A. Increase event efficiency with 2-way radios to keep everyone in the know. Extend radio range with up to 50 radios and our high-powered repeater system to keep communication up at any location. From cruise ships to air freight to local van delivery-- whatever your scope, our strategic team creates the most effective, efficient transport plan and our logistics team powers it into action. Whether you need conference collateral delivery or company executive or session presenter transportation, our logistics team handles all the details to ensure everyone and everything moves safely and effectively to get where they need to go. With holding facilities in both the United States and Canada, we offer safe storage and organized in-transit holding for pre- and post-event logistics continent-wide. With a creative team to design, develop and format for the big screen and an on-site technical team to assist, we cover all scopes of support to make every presentation a success. Make events more accessible with live translation. Our state of the art digital interpretation equipment combined with fully accredited interpreters means everyone is included. Save on logistics and extend your event's reach with this laser-powered, latest generation technology. Carry communication signals a few hundred feet or a dozen miles to help you achieve success.